A beautiful lawn can make all the difference in the appearance of your home, business, or property. The regular attention of our lawn care team ensures a lush, healthy lawn for you and your family or patrons to enjoy. From our scorching hot summers to our unpredictable winters, Central Kentucky lawns are exposed to weather extremes. 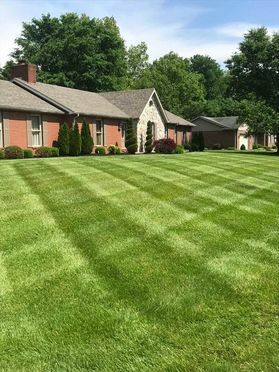 We know Central Kentucky lawns and understand what it takes to keep them green and lush throughout even the most extreme summer months. To look their best, lawns need weekly mowing during the growing season. Our lawn mowing service includes mowing the entire yard and line trimming around all trees, posts, and fencing. We also edge all sidewalks, patios, and driveways with a blade edger and clean up all of the trimmings. We are one of the leading landscape maintenance companies serving the Central Kentucky area. Many of your friends and neighbors choose Green Thumb Lawn & Landscape as their lawn and landscape service provider. 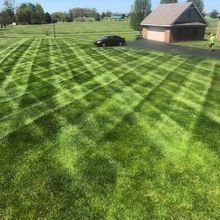 We have built our reputation off of providing excellent, reliable service that goes above and beyond what most other lawn care companies in the Central Kentucky area offer. A healthy, beautiful, weed-free lawn not only adds value to your landscape and property, but also adds to the quality of your life. You can't hide your front yard, so make sure it's beautiful! All of our lawn maintenance workers are trusted Green Thumb Lawn & Landscape professionals, so you can rest assured knowing that your lawn is in the hands of a qualified team. We pride ourselves on our prompt and reliable lawn service. 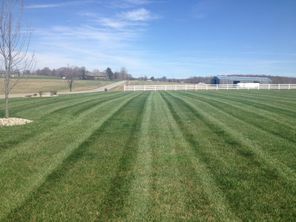 From master-planned communities and apartment complexes, to schools, retail centers, business parks, and hotels, we offer reliable lawn care services to commercial facilities in the Central Kentucky area. Let us set the right first impression for your business.